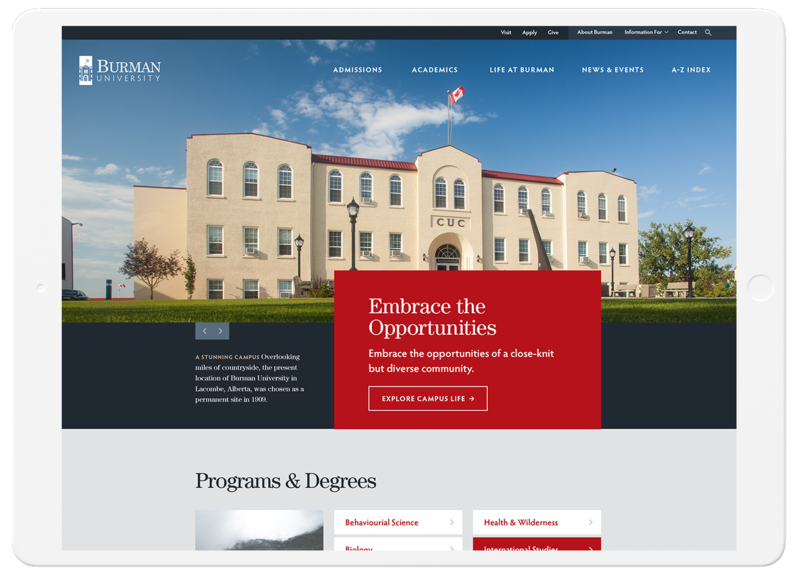 When Burman University, a private institution in central Alberta, asked us if we could help them improve enrollment by overhauling their website, we jumped at the opportunity. 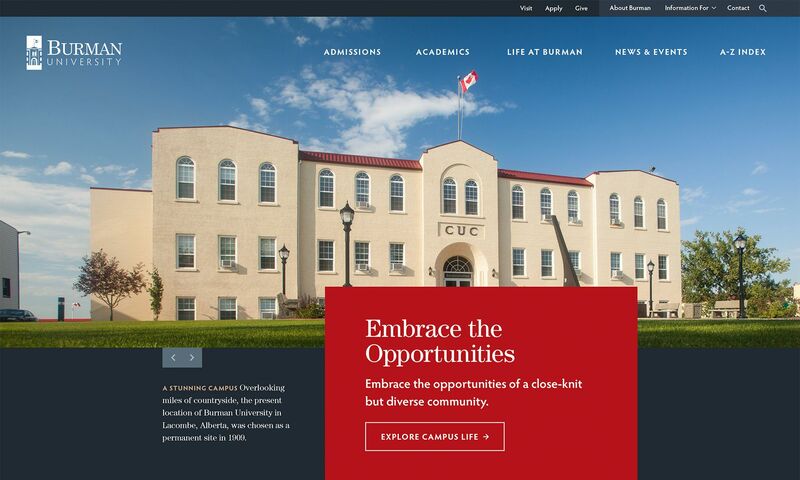 Located just a few hours drive from the Canadian Rocky Mountains, Burman has an excellent range of academic opportunities and is surrounded by natural beauty. 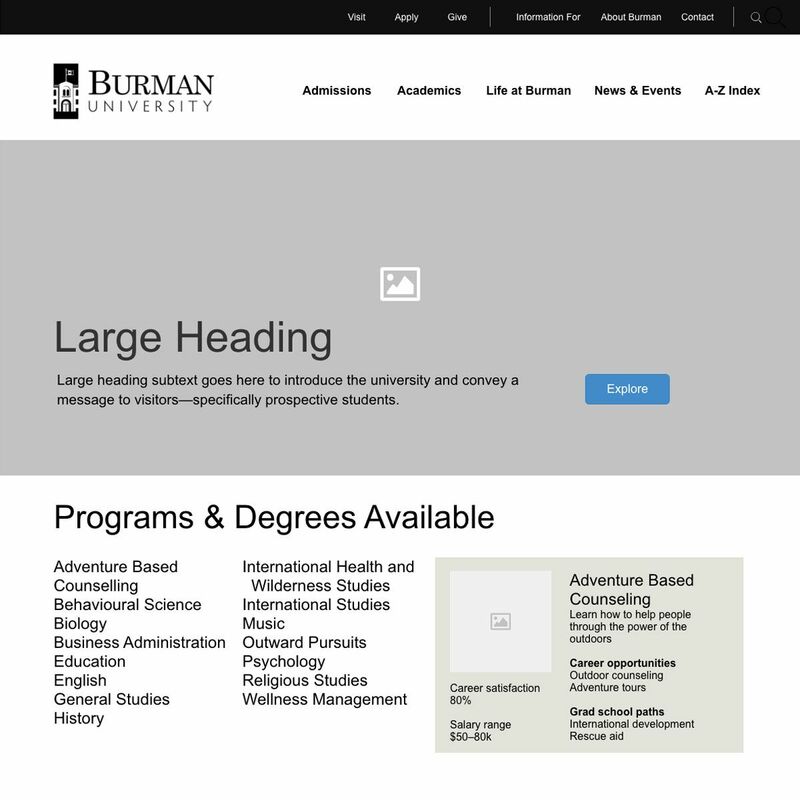 The challenge was to find the best way to tell the Burman story online and invite potential students to enroll. 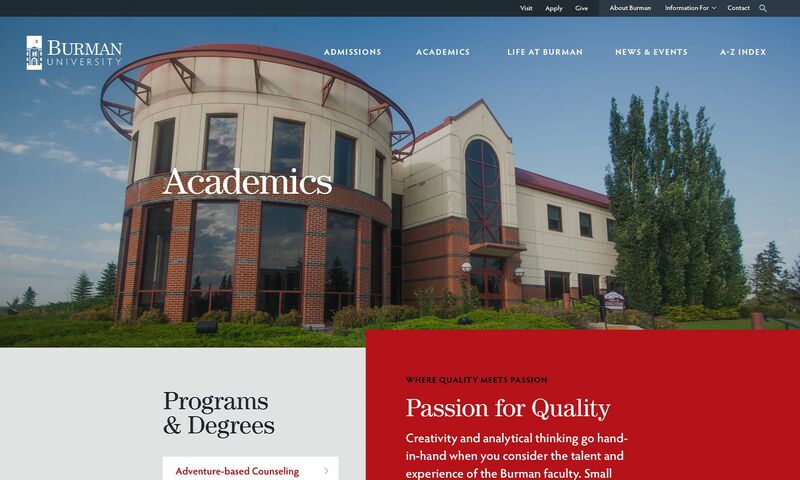 Burman had recently undertaken a full rebrand and renaming, and the university was in need of an updated design to accompany their new identity. Dated design and a slow-loading site were turn-offs for visitors to the old site. 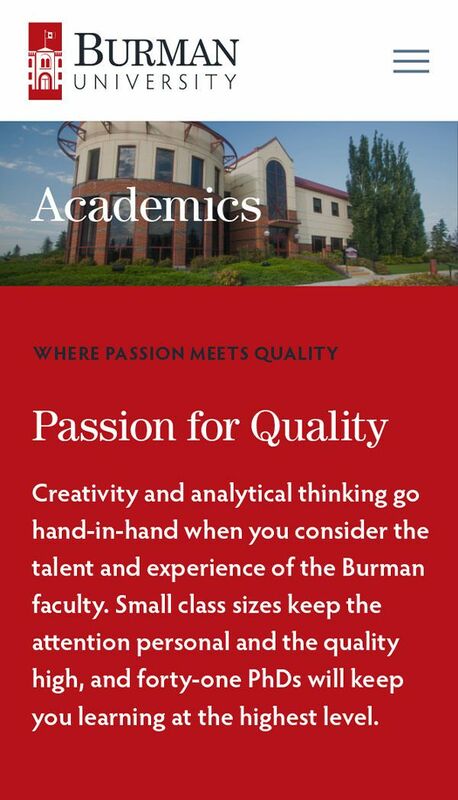 We kicked off our work with research on Burman’s campus to determine the needs of aspiring students as well as the pain points of current students, faculty and staff as they navigated the Burman site. We then utilized our research findings as part of our on-site design sprint to help us craft our project goals, validate assumptions and create a development roadmap for the new site right from the outset. 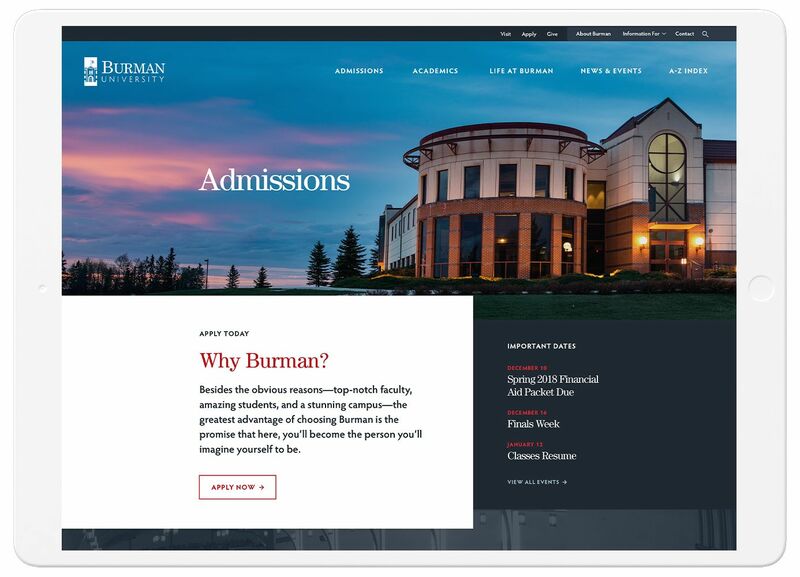 Our team explored UX with Burman University on-site, allowing us to test user flows before they hit high-fidelity design. 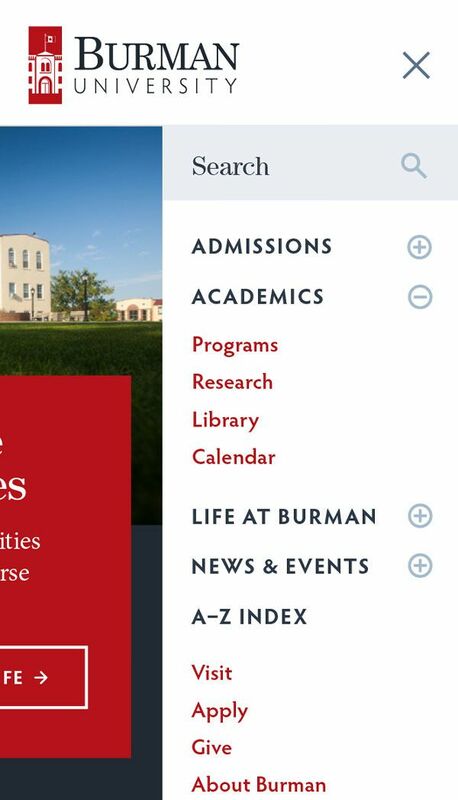 Guided by our research findings, we reorganized site navigation so that it was easy for prospective students to see what academic and campus life opportunities Burman offered. 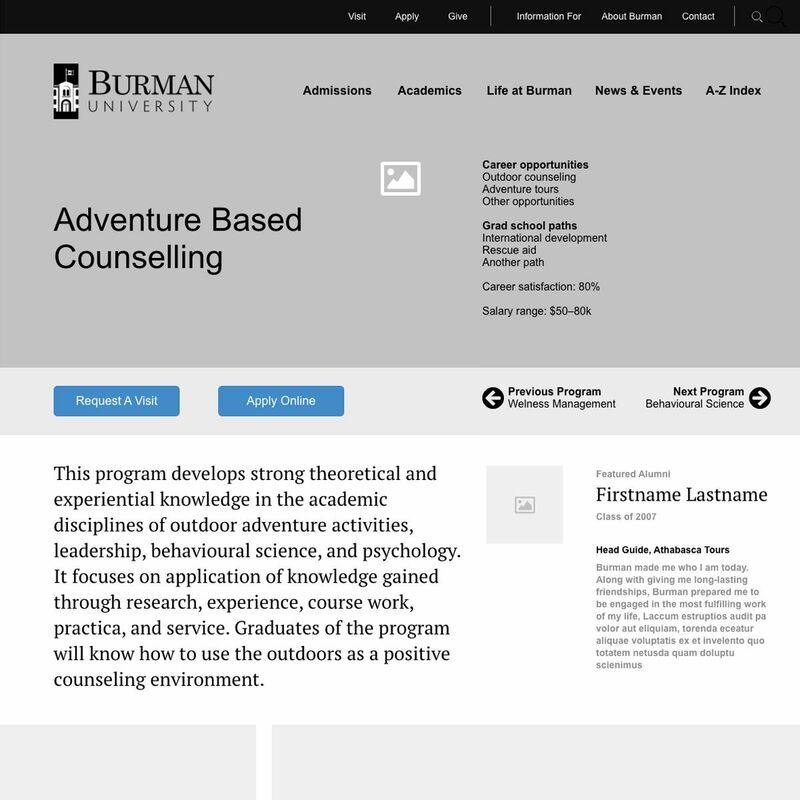 It was particularly important for us to highlight Burman University's unique degrees such as Adventure Based Counseling. 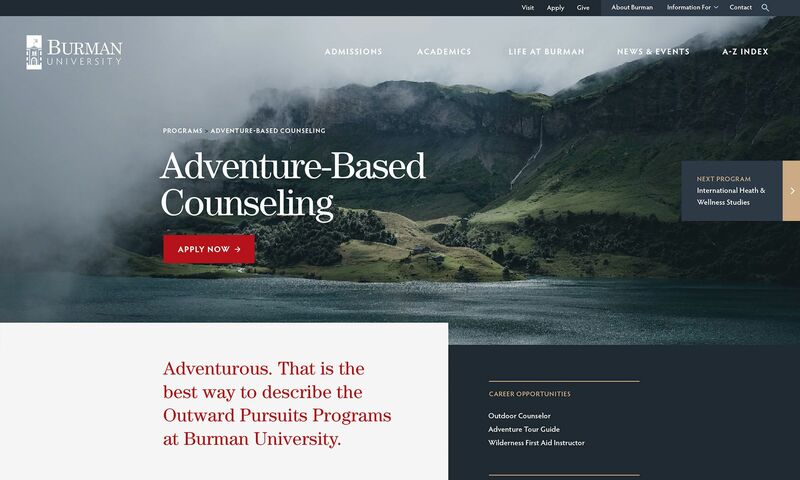 We spotlighted these unique educational opportunities using beautiful photography and compelling copy that showed off the Burman difference. 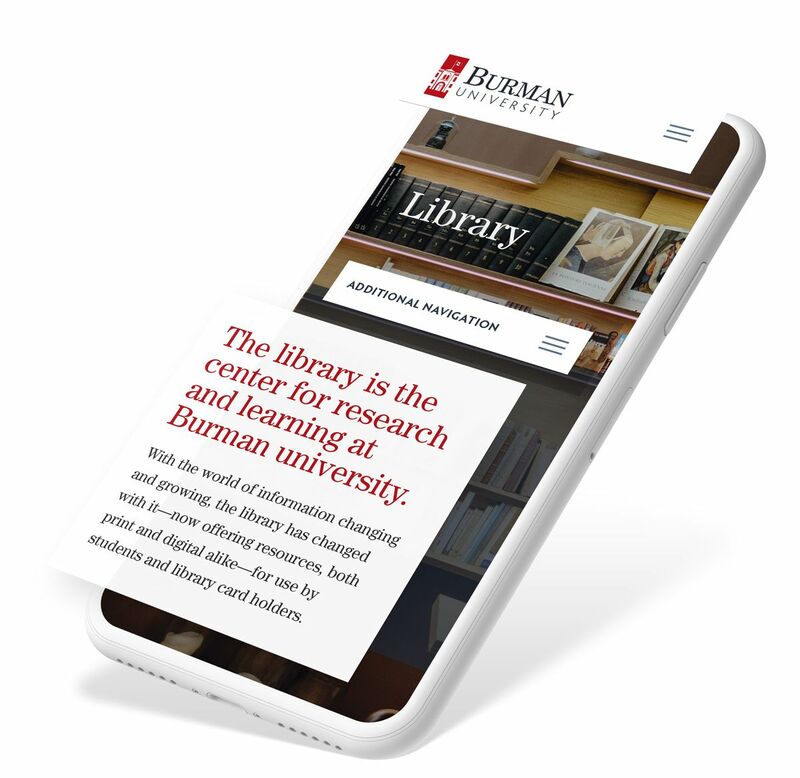 In order to optimize page load speed, we built Burman's new site on Drupal 8 and hosted it on Pantheon. This allowed for ultrafast handling on any device a visitor might use: desktop, tablet, smartphone, and everything in between. Also, we made sure that images were sized appropriately for relevant screen sizes. 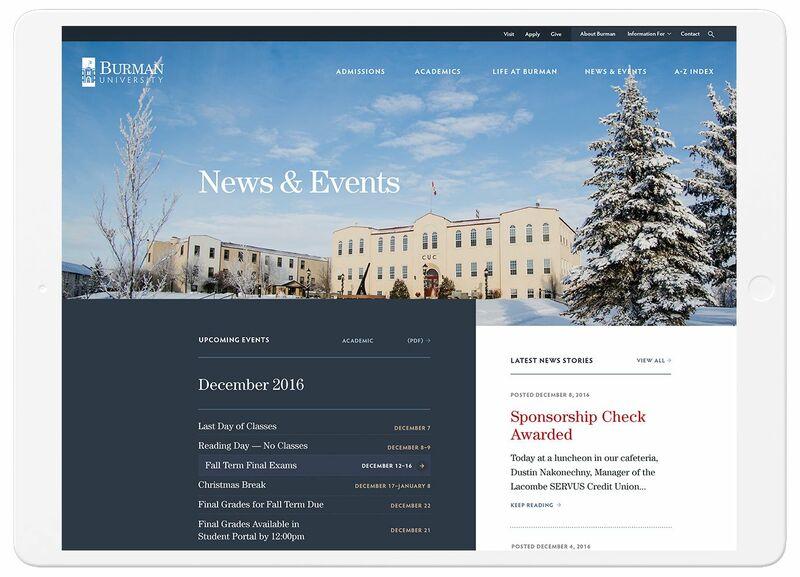 As our primary user demographic heavily favored mobile devices, we focused on making the mobile user experience smooth and engaging. 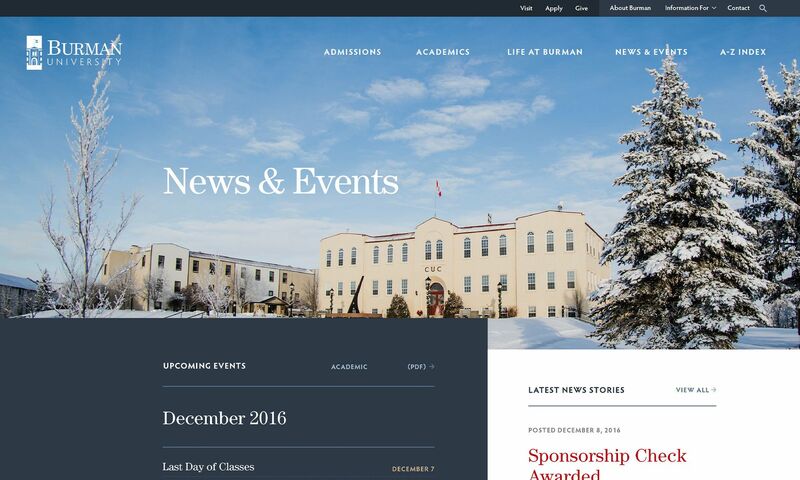 Our current website was in need of not just a new design but an entirely new way to present our university. We chose R&D because of their experience in higher education and because we appreciated the work that they have done with other schools. The results of our work at Burman speak for themselves. 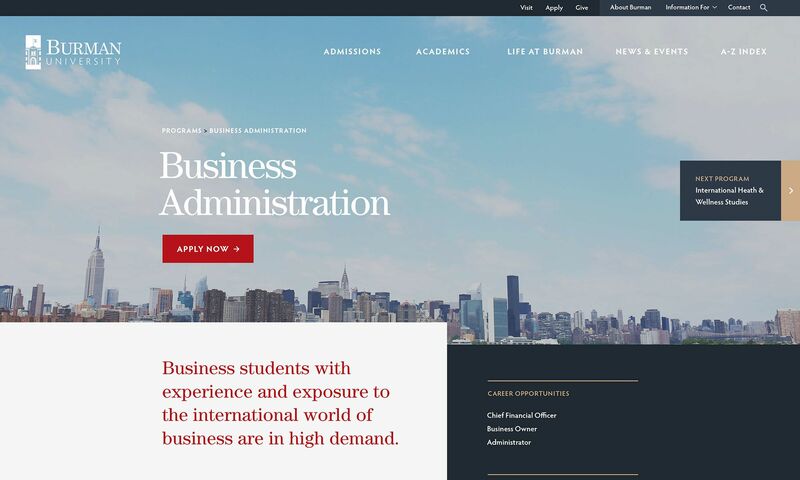 Within a few months of the new site launch, we observed a significant increase in traffic to the Apply page as well as to the Visit Campus page, both key metrics when it comes to improving enrollment. We decreased the page load speed across devices, even with richer media content.